Indaris’ mentor, he used to live in Aracho in the Timiro Kingdom. He now is the head priest at the Obelisk of Osiris. Philip Entaro was born to a minor noble family in Credia, after a falling out with his Father, who wanted him to continue the family business whereas Philip thought his family business was corrupt as they occasionally smuggled goods in decided he wanted something better so he signed up in the army in Aracho so his father wouldn’t find him. A year and a half after he signed up he beat his commanding Officer unconscious after he found him abusing a peasant girl and was sent to the border as Punishment. Surprisingly enough he found the hard work of being a Border Scout at Fort Hilde rather rewarding as they fought off orc and ogre raids. However after a raid that left the Fort commander’s son badly injured he was tasked with a force to track the raiders back and destroy them. 3 Months of skirmishes in the Old Kingdom eventually led them to the villages where the Orcs lived. The Lieutenant of the Squad ordered the attack, and over the next 5 hours his nightmares were born. The attack went well and they killed off most of the fighting force, and then all of his squad but himself and 2 others slaughtered the Orc females and Orc young that were cowering in caves, right at the end the Orc Shaman summoned a mighty creature of vengeance who appeared wreathed in flames who then butchered the rest of the squad but Phillip and his 2 friends managed to kill the Orc Shaman at the end and the Spirit of Vengeance disappeared, but not before vowing to eat his soul. The travel back to the Timiro Kingdom was hard as one of his friends were injured, one of them badly. They almost made it back to the River when they were attacked by another roving band, this time of ogres. Knowing that he couldn’t get both his friends free he saved the least injured one and ran to the river, leaving the other to die at the hands of the Ogres. Philip eventually made it back to Fort Hilde but was never the same. Nightmares plagued his sleep and he could hear his friends screams and would wake up screaming. He handed in his commission back in Aracho and started wandering the streets as a Beggar. A young Priest who was traveling though the area from abroad found him and they immediately made friends and that’s where Father Phillip started his life as a Priest. The nightmares stopped while he was helping people so he though himself into his priestly work with vigor, and helped the poor and downtrodden as much as he could, even the Orc and Ogre slaves could call upon him to tend them. He deplores the state of slavery that Timiro allows and thinks that it will be a very big problem when, not if, the Orcs rebel so he tries to use his influence to moderate the Gentries abuses of them which hasn’t made him popular amongst the nobility. 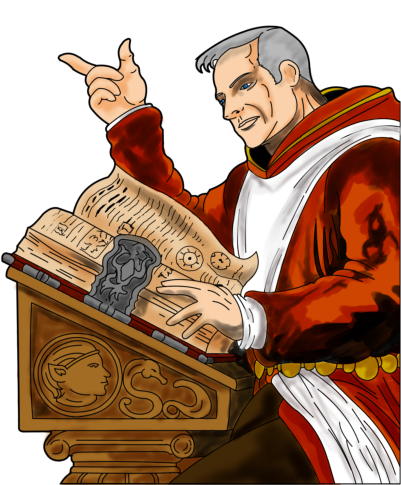 His friend and Mentor went on to be the Religious Leader of Credia for 10 years, and then was moved to the Western Empire and moved up the Ranks there. Father Philip is content to be where he is as he gets to help the poor more and leaves the bureaucracy to others. Likes playing chess in the afternoons and is very fond of his Rose Gardens.